Old hands know that there is a vast difference between theory and practice, but beginning anglers often have difficulty separating the two concepts. In recent years fly rod manufacturers have produced rods that are advertised as being capable of making longer and longer casts. 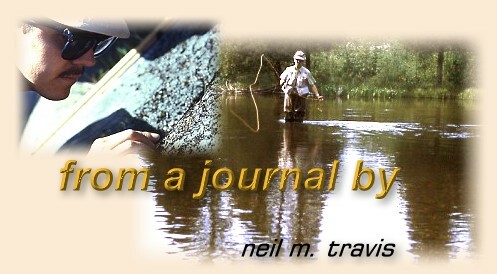 Articles and books on fly casting have devoted barrels of ink to techniques that will allow the caster to make longer and longer casts. By reading many articles on fly casting it would seem that if you can't effortlessly make 70 and 80 foot casts you can't call yourself a fly fisher. Now in theory the farther you can cast the less likely you will be to spook the fish, and in certain applications that may be true. Double hauling your entire fly line may have a place in a casting tournament or when fishing a big steelhead river or on a bonefish flat, but for most anglers an accurate 30 or 40 foot cast will put more fish in the net at the end of the day. Case in point is fishing for trout on one of my favorite Montana high mountain lakes. One morning I was slowly poking my way along the shoreline in my canoe looking for rising or cruising trout in the shallow water near the shore. This particular lake is filled with downed timber, and has extensive beds of thick weeds, and by early summer the water is clear as crystal. Since there are numerous fish eating birds in the area the fish tend to be quite spooky in the shallow clear water so a slow careful approach is necessary to avoid spooking them. When a fish is spotted the angler must lay down a gentle accurate cast. If the fish takes the angler must immediately get the fish on the reel, keep its head up and out of the downed timber or thick weeds. This is best accomplished by keeping the rod low to avoid any overhead motion, and keeping the cast as short as possible. I had just landed a nice brown when I looked up and saw a drift boat approaching the upper end of the cove where I was fishing. There were two men in the boat, one manning the oars and the other was standing in the bow of the boat with his fly rod at ready. The water in this area is quite shallow, and large trout frequently cruise along the shoreline in plain view. Now in theory a person standing up in the bow of a drift boat can spot rising or cruising fish before they get too close. It's true, but because of the laws of refraction the higher above the surface of the water an object is the better a fish can see it. An angler standing up in the bow of a drift boat along a lake shore is waving a red flag to every trout within casting distance and beyond. The angler in the boat executed a very nice cast, pumping the rod in graceful and powerful strokes with a nice tight loop, and then shot a 70 or 80 foot cast toward the shoreline. "Nice," I thought, as I watched the line straighten out and softly drop on the surface of the water just a few feet off shore. From my vantage point I could see the wakes generated by the trout as they spooked and headed for deeper water. Those trout were gone for the day. Seemingly oblivious to the obvious the angler continued to cast to the same area for several minutes before they moved on down the shore. During the course of the morning I saw the same boat cruising along the shore, and poking into several of the small coves prospecting for trout, but I never saw the angler in the bow ever connect with a single fish. In theory a drift boat which allows the casting angler to stand up in the front of the craft should be almost perfect for all types of fly fishing, but they are not a general purpose fishing platform. While they are a great boat for fishing on moving water they are not well suited for angling in still water. An angler in a float tube, pontoon boat, or canoe has a much lower profile, and can get much closer to his quarry. In lakes with heavy weed beds or other underwater hazards an angler that makes a shorter cast has a greater chance of landing the fish that he hooks. There is one more advantage of getting close to your quarry. Close observation of a cruising or feeding fish, whether it's a trout or a carp, gives the angler much more specific information on exactly what it is feeding on, how it is taking its prey, and precisely where to cast to maximize the chance of actually hooking the fish. It's easier to select the correct fly when you can see what the fish is eating rather than making an 'educated guess' from 70 or 80 feet away. Perhaps the greatest benefit to getting closer before you begin casting is the heightened sense of anticipation you get when the fish that you are trying to catch is so close that you can see the spots on its side. Years ago I fished a large slough that held some very large trout early in the season. By early summer thick weeds made fishing this piece of water impossible, but during a brief period between the end of winter and the beginning of summer the possibilities were exciting. The technique was to sneak along the bank and find a place to sit down. Once seated it was necessary to spend a few minutes just watching. The water was crystal clear, and large trout would cruise up and down the slough as if they were on tracks. Sometimes they were feeding on small midges on the surface, and other times they were eating small aquatic insects along the bottom. After ascertaining what the menu item was for the day I would tie on an appropriate fly and wait until I saw a trout cruising in my direction. By making a short sidearm cast I would drop the fly where I thought the trout would intercept it. Since the water was still fairly cool the trout were very slow and deliberate in their feeding method. What made the entire scenario more interesting is that most of the trout were in the 20 plus class, and the flies that they normally were eating at this time of year were the same size. I think a 20 inch trout on a size 20 fly is good fishing by most standards. What made it especially exciting was the fact that the fish was so close that I could watch the entire drama unfolding right before my eyes. The slough is gone now; a victim of spring run-off from a greater than average snow pack, but the memory of those few precious times when I was eye ball to eye ball with those large trout is something that is still fresh in my mind. I have forgotten the circumstances surrounding many of the large fish that I have caught, but I never forget those times when I have gotten so close that I could watch the action from start to finish.